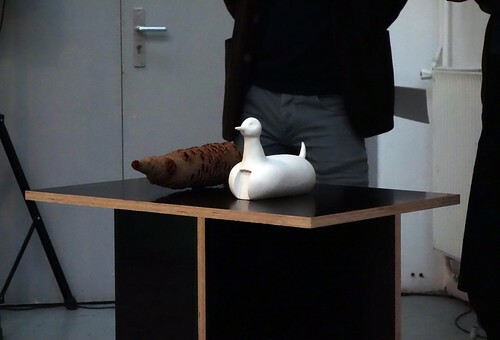 Kristina Solomoukha & Paolo Codeluppi, The Ambiguous Origin of Architectural Species, a performance at Les Laboratories d'Aubervillier, May 2013. Meet the artists, learn about their work, and hear about the project they are planning for Lynden. 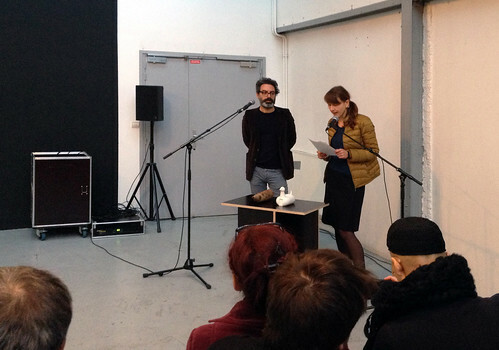 Artists Kristina Solomoukha and Paolo Codeluppi have embarked on a two-part residency that will combine research, travel and a final presentation in the summer of 2014. Their research is guided in part by the ideas of experimental archeology, as well as by history and the way we perceive it. Their work takes the form of installations, often accompanied by performative presentations that build relationships between elements, creating a narrative or story that exposes the mechanisms underlying the development of their work. Travel is central to Solomoukha & Codeluppi’s collaborative practice, and they deploy objects and images collected on their trips alongside objects they create themselves. These objects serve as prompts and catalysts for their ongoing dialogue, providing them with material to elaborate their thought processes, and in turn to present them. At Lynden—an open air gallery—Solomoukha & Codeluppi are beginning a project that explores the relationship between sculpture and space. Their starting point is the notion of heteropia as defined by Michel Foucault: as the physical existence of utopian spaces that house the imagination. They will make a video document of events and places that best explain this concept to them. Ultimately, it will be presented as a video projection in the sculpture garden. While at Lynden this summer, Solomoukha/Codeluppi will work on their proposal for this projection, whose working title is Video Sculptures. They will also be researching and filming material for a project supported by the Ville de Paris grant awarded by the Mairie de Paris that will culminate in a presentation at the Contexts gallery in Paris in the first half of 2014. Kristina Solomoukha and Paolo Codeluppi began to work together two years ago. They had their first collaborative solo exhibition, Our Great Projects, at Contexts in Paris in 2012. In 2013 they participated in Commisariat pour un arbre #4, a group show in the Crystal Palace of Bordeaux, and in Degré 48 at Les Laboratoires d’Aubervilliers. Currently they are preparing for Cosmic Debris and Hidden Landscape, a solo show at FRAC Poitou-Charentes in Linazay, France. The exhibition opens October 5, 2013. Solomoukha and Codeluppi live and work in Paris, France. Paolo Codeluppi was born in Singapore in 1974. He graduated from the Brera Academy in Milan, Italy, in 1999 and from the École Nationale Supérieure des Beaux-Arts in Paris in 2001. He participated in the Fondazione Ratti's workshop in 1999 with guest artist Hamish Fulton. Between 2001 and 2003 he teamed up with artists Seiulgi Lee, Simon Boudvin and Ciryl Dietrich to curate Paris Project Room, an artist-run space. Kristina Solomoukha was born in Kiev, Ukraine in 1971. From 1986 to 1989 she studied at the School of Industrial Art in Kiev. She graduated from École Nationale Supérieure des Beaux-Arts in Paris in 1995 and in 1997 she took part in the postgraduate program at the École Régionale des Beaux-Arts, Nantes, France. From 2001 to 2002 she studied at the École d’Architecture Paris-Malaquais. She has been on the faculty at the École Européene Superieure d’Art de Bretagne in Rennes, France, since 2003. Solomoukha was last in Milwaukee in early 2010 in conjunction with the opening of Spatial City: An Architecture of Idealism at Inova. Solomoukha was an artist-in-residence in the University of Wisconsin-Milwaukee’s Peck School of the Arts and School of Architecture and Urban Planning. The 2013 residency is supported in part by the Mairie de Paris.